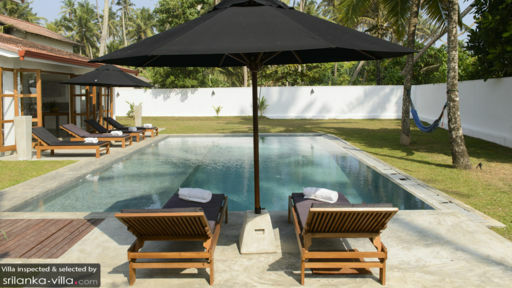 Stella Beach House is a newly-renovated holiday property on the southern coast of Sri Lanka, right next to the beautiful and popular Mirissa beach. With 400 metres of private beach access, sprawling gardens with towering palm trees that weave their around and stunning views of the ocean, the villa is quintessentially meant for family vacations. The four-bedroom home is perfect if you’re travelling with children as there is much ground to cover right on the property and they can run around with ease. 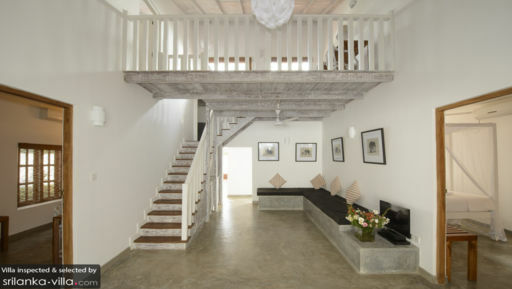 The house has been designed in proper Sri Lankan style with whitewashed walls and red, shingled roofs. The four bedrooms at Stella Beach are built two in the main pavilion and two separately on the gardens for more privacy and more space. The bedrooms are well-furnished with double beds and one with twin beds; perfect for children. The simple décor is ideal because there’s so much beauty outdoors that it complements the minimal décor. The bedrooms are all en-suite with their personal bathrooms for your convenience and no morning squabbles over who gets to go first. Great for balmy afternoons, the bedrooms are even air-conditioned to offer a cooling and calm environment. Enjoy an alfresco-style living experience at Stella Beach House where the 20-metre swimming pool is the characteristic feature amid the lush, green gardens. Hammocks, sun chairs, and outdoor dining area a reality surrounded by utmost natural beauty. Get ready to be wowed into blissful oblivion and for an amazing time enjoying the peace and quiet of this area. The gardens are abundantly grown with tropical flora including towering palm trees through which you can catch exceptional glimpses of the ocean out front. Right from the veranda where you have the outdoor dining area, guests can access the massive, fully-equipped kitchen at Stella Beach House. Complete with an island in the centre, the kitchen is excellent if you’re a chef and would like to master your skills or you can even request for a personal chef to do the deed. From there, head to the indoor living area which has been furnished comfortably for a peaceful end to the day when you wish to retreat to the comforts of the couch especially with a TV and DVD player. Modern comforts are not too far in the villa even with all this natural beauty around you. The indoor dining area is housed right beside the glass doors leading out to the patio so you can enjoy a classic view while digging into your delicious meal. The staff is happy to help with anything you might need including making arrangements for transportation, excursions, and day trips. Some of the services such as in-villa chef can be arranged upon request in case you wish to try out local flavours over ready-to-eat meals. Stella Beach House is ideally located near Mirissa beach, one of the quieter, non-commercial beaches with simple beach shacks and cute restaurants and nothing to interrupt your peace. You can laze about all day on the sandy shores taking in the mesmerising view and enjoy a drink with your loved ones. Sri Lanka is famous for many things and surfing is one of them, so head to nearby beaches to hit the waves. Turtle hatcheries are another excellent and precious experience especially when you see hatchlings making their way back into the water.